Grand Teton National Park is a beautiful area located in northwestern Wyoming, bordering Yellowstone National Park. Comprised of several diverse habitats, the park is home to 7 species of coniferous trees and more than 900 species of flowering plants. There are more than 300 species of birds, 16 species of fishes, and several species of mammals. During the summer months, the park appears all but quiet. Roads are busy with tourists hurrying to secure a camping spot, make a float trip, and pack as much sightseeing as possible into a short summer vacation. Do you want to have the park all to yourself? Here is the secret: get up early. Whether you are driving down the main park road, or gazing across the Willow Flats from Jackson Lake Lodge, early in the morning the park is deserted. You will hear birds and easily spot wildlife that comes out to feed. Underneath the granite peaks of Grand Teton National Park in Wyoming, you will see moose, elk, and bears (if you are lucky). If you are into adventure and willing to get off the road, this national park will give you fresh air, mountain lakes and colorful sunsets. Hiking, camping, climbing, biking, and river rafting are all available in the area. For fantastic views and a moderate hike with even better views, head to the Jenny Lake Visitors Center. From the visitors center, take the boat across the lake and hike up to the Hidden Falls and Inspiration Point. The park has more than 100 alpine and back country lakes, and seven lakes at the base of the Teton Range: Jackson, Leigh, String, Jenny, Bradley, Taggart, and Phelps. Snake River flows through, offering spectacular views of the mountains reflecting in the water. Jenny Lake: This spectacular lake is a must-see, whether you are just driving by or decide to go on one of the hikes around the lake. During the summer months, a shuttle boat takes vacationers from the dock near the visitor's center across the lake to the Hidden Falls and Inspiration Point trailhead. From Inspiration Point, you will have the most incredible view of the lake. The hike is mostly up hill, 1.9 miles from the west boat dock. At the 1 mile point, you will be able to admire Hidden Falls as well. Jackson Lake: The largest lake in Grand Teton National Park, Jackson Lake covers 25,540 acres (10,340 hectares) and reaches a maximum depth of 438 feet (134 m). The lake, located 30 miles north of Jackson, Wyoming, is an outdoor paradise for hikers, boaters and wildlife watchers. The main park road winds from the southern across the scenic dam, past the Jackson Lake Junction, and north past Colter Bay and Leeks Marina. Highway 89-191 follows the eastern shore of the lake north, featuring several turnouts and two picnic areas. You can observe aspen groves, colorful wild-flower meadows and forests, which attract mule deer, elk, white pelicans, Canada geese and other waterfowl. We even saw a bald eagle near Colter Bay. In the summer, there is fishing for cutthroat, brown, and lake trout. Hiking to Phelps Lake Overlook: Hikers to the Phelps Lake Overlook from the Death Canyon Trailhead are rewarded with a magnificent view of a mountain lake and the surrounding mountains. If you only have time for one hike while in the park, this is one of the top scenic spots. From the Moose-Wilson road, drive to the Death Canyon Trailhead on an unpaved road, and park your car near the sign. The uphill trail to the overlook follows a stream which is home to numerous birds such as hermit and Swainson's thrushes and green-tailed towhees. Once you reach the overlook, look hummingbirds which feed on the plants below. Yellow Pond Lilies Blanket Swan Lake in July and August: From the Hermitage Point Trailhead, located at the south end of the Colter Bay Visitor Center, trails lead to Swan Lake and Heron Pond. The trail leads past numerous wildflowers and lodgepole pine forests. The area is covered with yellow pond lilies, especially favored by beavers. The 3-mile loop is quite flat and takes approximately 3 hours to complete. Parts of the trail are in the shade which is quite welcoming in the summer. Heron Pond is nestled in lodgepole pine forests. We saw two trumpeter swans on the lake. After you pass it on your hike, complete the loop by returning past Swan Lake back to Colter Bay. Hiking The Two Ocean Lake Loop: Two Ocean and Emma Matilda Lakes were formed 70,000 years ago by a glacier. There are hiking trails around both areas which are not very frequented. Keep in mind that this is bear country - pay attention towarnings to ensure your safety. Along the way, you will see wildflowers, open meadows and woodlands. Two Ocean lies at 6,896 feet and the trail that surrounds it is quite flat. In the summer, there are many insects, so insect repellant will come in handy. Elk feed on meadow grasses in the early morning and in the evening. Other mammals that live in this areas include martens, red squirrels, mule deer, coyotes and black grizzly bears. The loop measures 6.4 miles roundtrip, with a 80-foot elevation change, and takes approximately 3 hours to complete. A heaven for outdoor enthusiasts, the park offers hiking, wildlife viewing, nature photography, backpacking, camping, climbing, fishing, swimming, boating, floating, canoeing, and biking. Easy and moderate day hiking trails can be found in all parts of the park. Here are some hikes you may consider: the Phelps Lake Overlook, Heron Pond - Swan Lake Trail, Two Ocean Lake, Inspiration Point and Hidden Falls. Colter Bay Village: Colter Bay Village is situated on the shores of Jackson Lake. It offers accommodations, a visitor center and a full service marina. The area is abundant with a wide variety of wildlife and flowers. From the marina, trails lead to the lakes, Third Creek, Hermitage Point, Colter Bay Corral and the Jackson Lake Lodge. The ponds are inhabited by beavers, muskrats, waterfowl and otters. You may also spot moose or elk chewing on the juicy green grass near the lakes. For beautiful views of Jackson Lake and the Tetons, follow the 2-mile Lakeshore Trail to a forested peninsula on the lake. Bird-watching at Christian Pond: If you are staying at Jackson Lake Lodge, Christian Pond is located nearby. You can walk from the lodge, or drive and park your car in the small parking area north of the bridge. This unique pond is an excellent spot in the park for bird-watching. One can observe sparrows, soras, sanhill cranes and snipe. Sometimes trumpeter swans visit the area. Many migratory waterfowl can be seen nesting near the pond. Close to the parking area, you will reach a small hill that overlooks the water. Bring your binoculars and enjoy some of the best bird-watching in Grand Teton National Park. Be very careful while hiking in this area - there can be moose. You should follow all of the National Park Service warning signs very closely. The 3.7-mile loop around is fairly flat. The trail begins near the hotel, about a mile north from Jackson Lake Junction. Beautiful Flowers in Grand Teton: The park is home to 7 species of coniferous trees and 900+ species of flowering plants which grow in the park's diverse habitats. Sagebrush is the most widespread habitat type in the park. More than 100 species of grasses and wildflowers grow there. Lodgepole pines dominate in these forests. Other plants include firs, aspens and spruces. Wherever you go, don't forget to admire the unique flora which has adapted so skillfully to this harsh climate. Summers are short here, but the plants are abundant and beautiful. Vegetation is most abundant near rivers, lakes and ponds, including Jenny Lake, Heron Pond and others. The Rockefeller Parkway: In 1972, Congress dedicated a 24,000-acre parcel of land as the John D. Rockefeller, Jr. Memorial Parkway to recognize the generosity of the late conservationist and philanthropist who made significant contributions to the national park system. The highway from the south boundary of Grand Teton to West Thumb in Yellowstone was also named after John D. Rockefeller. The road connects both parks, offering scenic views of the woodlands, and the mountains. It ends at the South Entrance to Yellowstone. To the south lies the scenic Teton Park Road which stretches from Moose Visitor Center in the south to Jackson Lake Junction in the north. It leads past Jenny and Jackson Lakes, offering beautiful views of the Teton Mountain Range. On the way, you can stop at the Signal Mountain Lodge and enjoy a lunch overlooking Jackson Lake. There are several turnouts along the road where you can safely pull over, enjoy the view and take pictures of the park. In the early morning and evening, you may even spot wildlife right off the road. The Teton Park Road is closed in the winter. The best time to go is during the warmer months. Jackson Lake Dam: Jackson Lake Dam is located between the Signal Mountain Lodge and Jackson Lake Junction. It dates back to 1906, but it has been upgraded several times throughout history to make it more resistant to earthquakes. Visitors can park near the dam to walk across it and down to Snake River which continues to wind trough the park. The view is quite awe-inspiring. You'll be surrounded by the noise produced by the powerful water rushing down into the river. After you view the dam, stop for lunch or dinner, go on a float trip or on a day hike to look for birds, moose and other wildlife. Nearby, you will find several hiking trails, including Swan Lake and Heron Pond where you can see beautiful yellow lilies, swans, beavers and many other animals. Take a Float Trip down Snake River: Approximately 50 miles of the 1056-mile long Snake River lies within Grand Teton, Wyoming. Areas around it are a great place to spot wildlife. Oxbow Bend, just south of the Jackson Lake Dam, presents exciting wildlife watching opportunities. The park has seven major lakes. Several float trips are offered every day in the summer. The best place to find out more about them is one of the visitor's centers. Keep in mind that the sun is very strong, reflecting off the water. Wearing a sunscreen is a must. There are several lodges in the park. Jackson Lake Lodge features spectacular views of the Tetons, the park wildlife, and romantic sunsets. Signal Mountain Lodge overlooks Jackson Lake and offers three restaurants. You can also stay in several hotels, lodges and inns in the nearby Jackson Hole, including Amangani. The campgrounds in the park are open from the end of May to the end of September. Most campgrounds fill up by noon, so get there early if you want a space. The lodge rooms at the Jackson Lake Lodge give you what is one of the best views of sunrise over the Tetons right from your bed. (Although you really should get out of bed if you are planning on a vacation to a national park.) For hotels outside the park in Teton Village, try the Snake River Lodge or the Hostel X or the Teton Mountain Lodge. Teton Village is located a few miles from the entrance to the park. Dining with a View at the Signal Mountain Lodge: Stop for a scenic lunch at one of the Signal Mountain Lodge restaurants which overlook Jackson Lake. There are three different dining options to choose from. Trapper Grill serves casual American foods, such as burgers, sandwiches, salads and tasty deserts. The Peaks Restaurant offers a continental menu with regional specialties. 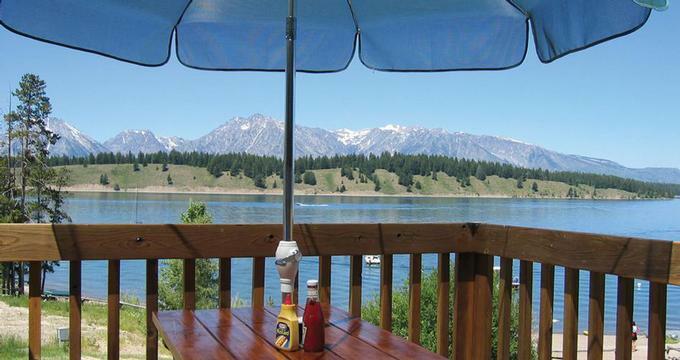 Or have a pizza at the Leek's Marina & Pizzeria which overlooks Jackson Lake and the Tetons. If you are there just for the view, Deadman's Bar serves margaritas. The lodge also offers accommodations, starting from $98 per night for non-view cabins, and from $199 for a room overlooking the lake. For reservations, call 307-543-2831. Be sure to book early. Jackson Lake Lodge is located inside the park, overlooking Willow Flats. This is the best place to stay in the national park if you want to enjoy spectacular sunsets and sunrises with the Tetons in the background. The lodge offers 37 guest rooms in the main lodge building, and 348 rooms in adjacent cottages. The main building rooms are very hard to get, especially those with a view. Even if you do not have time to spend tye night, you should not pass up a visit to this unique building. The main lodge room features 60 foot picture windows with spectacular views of the Tetons. This is where you should go to experience a magical sunset over the mountains. Dine at the Mural Room, a formal restaurant serving delicious entrees. Come early to get accommodated at one of the two-person tables next to the windows overlooking the Teton mountain range. In the evening and early morning, the lodge terrace overlooking Willow Flats is a great place to spot wildlife such as moose or elk. Willow Flats are freshwater marshes stretching between Jackson Lake Dam and Colter Bay. The best place to get a view of the flats is from the lodge. Early in the morning and in the evening, the area becomes the preferred feeding area for elk and moose. Streams that flow throughout the flats are home to beavers, muskrats and waterfowl. In the evening, the Tetons form the perfect backdrop for a beautiful mountain sunset. Mornings are the best time to enjoy a peaceful view of Mt. Moran from the hotel. When you are driving through Grand Teton, a stop at the scenic lodge is a must. Not only will you be able to look for wildlife grazing on the flats, but you will get some of the best views of the Tetons as well.Room rates start from $167 for non-view rooms, from $235 for rooms with a view, and from $410 for suites. For reservations, call 800-628-9988 or 307-543-3100. The lodge opens for the summer season in May. Fly to Jackson Hole Airport in Wyoming and then rent a car. A rental car is the best way to get around in the park, however, you will get the most out of your vacation if you get out of the car and explore a few of the many great trails in the park. With daytime temperatures in the 70s, June, July and August are the best months to visit the park. However, crowds can be an issue in August. If you do decide to visit in August, start your day early to get a jump on the crowds. Moose Visitor Center: Moose Visitor Center is the only one open year-round, from 8 am to 5 pm, and from 8 am to 7 pm in the summer. It is closed on December 25. For more information, phone 307-739-3399. It is located 12 miles north of Jackson town and features endangered species exhibits, a relief model of the park, and an introductory video. Facilities include a book store, maps, activity schedules, backcountry camping permits, boat permits, restrooms and telephones. A post office and store are located nearby. Located 8 miles north of the town of Jackson, Wyoming, Moose has a gas station, dining and lodging facilities. Stop here for a quick chuckwagon dinner, or pick up information about the park. From the tiny town, follow the self-guiding trail to Menor's Ferry and cabins along the Snake River, a great place for bird-watching. You can spot violet-green, tree, cliff and barn swallows, wood-pewees, dusky flycatchers and mountain bluebirds. Calliope, broad-tailed and rufous hummingbirds collect nectar from wildflowers in the summer. Colter Bay Visitor Center and Flagg Ranch:Colter Bay Visitor Center & Indian Arts Museum is located 25 miles north of Moose, adjacent to Jackson Lake. The visitor center is open from mid-May to early September. For more information and hours, phone 307-739-3594. From June through September, it offers craft demonstrations, museum tours and other interpretive programs. The Indian Arts Museum has on display a collection of American Indian artifacts, of the David T. Vernon Collection. Facilities include a bookstore, information desk, auditorium, telephones, restrooms, and backcountry permits. In addition to the Colter Bay, there are three other visitor centers in Grand Teton National Park: Moose (307-739-3399), Jenny Lake and Flagg Ranch. Moose is the only one open year-round. Flagg Ranch is an information station located 16 miles north on Highway 89-191-287, very close to the entrance to Yellowstone National Park. It is open June through August from 9 am to 5:30 pm. Jenny Lake Visitor Center: Jenny Lake Visitor Center is open during the warmer months and is located 8 miles north of Moose Junction on the Teton Park Road. There is a store where you can get last minute essentials before a longer hike. Bringing adequate amounts of water is a must at this altitude. Park your car at the visitor center and follow the signs. You can walk or take the boat across. The path is full of spectacular mountain scenery. If you would like to try an uphill hike, take the shuttle boat across the lake and go up to Inspiration Point to enjoy amazing views from the other side. The hours are as follows: June through August - 8 am to 5pm, September - 8 am to 5 pm. There is also a ranger station (307-739-3343 for more information) and a marina. The shuttle boat departs from the marina in the summer. Even if you just plan to drive around the park you should bring at least one water bottle per person. You don't want to become dehydrated and the altitude makes hiking more tiring than at sea level. Storms are possible at any time of year so bring some kind a rain gear. The high altitude of the park makes everything more tiring so give yourself a couple of days to adjust to the thin air before you go running around. Be careful when driving; the driver should watch the road and not look for wild animals. Accidents happen in the park when drivers stop suddenly when they spot a moose or other animal within sight of the road.